Whether you’re a married or an unmarried couple, you and your partner both need to know how to manage your finances properly. But before that, you must also know what are the mistakes you should avoid in the first place. A good financial management skill is important for you if you want to maintain your marriage. Love is undoubtedly the most powerful emotion that ensures the bond of marriage. But, no matter how deeply you love each other, it doesn’t work out for your marriage if you don’t have any idea regarding how to manage your household finances properly. Money is the prime cause of problems in a marriage. A recent survey by SunTrust Bank shows that financial issues trigger stress and friction between relationships. More than 35% couples, who are facing marriage issues, said it is caused by money matters. To avoid getting at each other’s nerves, you need to understand how to tackle the situation. You and your spouse, both will be responsible for some common money decisions. You can share the expenses of your kids and other household commodities. Being a couple, you both might also deal with miscellaneous expenses to survive in the society. Whether you’re just beginning your relationship or have been married for years, the debt load itself can give you a headache on your marriage. So, it’s always good to take a deep breath and have a serious open discussion on debts. 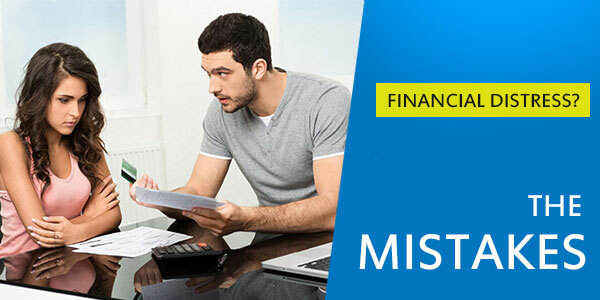 Let’s check out 5 common mistakes that couples make while handling money issue. Newlyweds often find issues with handling their finances together. So, being a couple, you should decide whether you’ll combine all of your finances together into one joint account, or you’ll keep your money separately in individual accounts. You must also decide what account you must maintain for household expenses. In a current survey by SmartMoney magazine, it is proved that 64 out of 100 couples trust putting their money in a joint account, 14 of them choose individual accounts, and 18 choose both. For many newlyweds, it would be the perfect choice if they can maintain the autonomy while managing their money. But the situation would be different if one spouse starts the married life with a high debt burden. In that scenario, you must find a way to consolidate your finances peacefully. Through time, couples find it easier to merge their finances after having kids or any special case...like mortgage criteria. But you both need to be square with the concept of merging your funds together, there's no need to make such decision in a hurry. In case of debts, couples have lots of disagreement. You, being a couple, might have ignored how much debt is too much and what kind of debts are bad for your financial health. In many scenarios, one partner starts the married life with a lot of debts than the other. It’s their relationship which compels them to ignore the possible financial stress they are going to encounter. You need to keep in mind that once you're married, your spouse's debts become your problem too. Of course, you’re not legally bound to pay off the credit card bills that your partner has left on the table, or any loans that’s totally in your spouse's name. But if you have even separate accounts, your spouse's bad credit score may harm your credibility too. So, couples who have not tied the knot yet, must make arrangements so that their money and properties can remain safe from each others creditors. But couple who are already married, they must pay off their dues asap without making any delay. Despite any hesitation, you both need to discuss your financial obligations and rank each item in order to get out of your debts. The most costly debt must come first, no matter who owns it. Together you and your partner should also consider the new debts. Keeping secrets are not good for a healthy marriage. Today or tomorrow, your financial secrets will be revealed somehow. Recent survey shows 36% men and 40% women hide price tags from their spouse if they buy something expensive. Old debts or a poor payment history will create problems when it comes to apply for a home loan or auto loan together. It’ll be a difficult situation for both of you and you can’t fulfill every financial need. If the money secret is keeping you off from your dreams, get over it. Make it open to your partner. A recent SmartMoney's survey revealed that men are more keen to take financial risks and willing to invest their money in different investment schemes, than their wives. Out of 100, there are 62 men who invest their money, whereas only 19 out of 100 women take that risk. So, being a couple, you and your spouse both need to sit down and discuss about your investment plans. You can be a huge risk-taker if you plan for investing with the money you're saving for your retirement; so, it’s wise if you both have the equal mindset regarding your investing plans. If you both can’t decide, ask help from a financial planner. You should review your investment plans and their growth together, at least once a year. If one investment goes wrong, you both can separately take risks with your own share of the money. Even if you have a successful job life, you have a good amount of income per month and don't have any debts to worry about, you might still find yourself too much unprepared for an emergency. An undetermined financial crunch, sudden illness, unexpected pink slip, an accident - anything can make your feet sweaty and make you slip off from the track. It’s a common tendency of couples that they panic when any unexpected emergency arises. Because of that fear, they often make wrong financial decisions. It’s your duty as a couple to plan and save dollar by dollar for an emergency fund, before anything happens. It’s better if you can gather up at least three to six months’ worth of living costs safely in your wallet. All couples should have proper knowledge about how to handle an emergency situation. Use that stash of three to six months' living expenses according to your financial priorities. Do not use that fund just to fulfill your luxuries or to entertain yourself. You both must know that you're walking on a fine line between comfort and catastrophe.